From a humble bubbling stream, rising in the Kaleni Hills in the Mwinilunga District of north-western Zambia, close to the borders with Angola and the Congo, the Zambezi River begins a meandering 2,574 kilometre journey from the heart of southern Africa to the Indian Ocean. The source is located 1,524 metres above sea level. The headwaters of the Zambezi were first discovered and mapped in 1886 by Frank Stanley Arnott, a missionary. 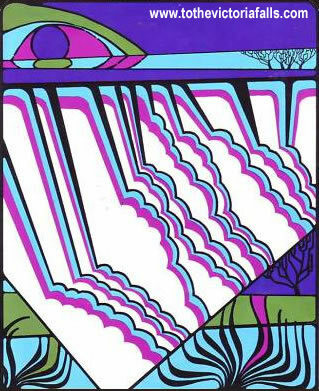 He described the marshland between the basins of the Zambezi and Congo rivers as 'the sloppy country'. At the Kalene Hills the missionary Dr Walter Fisher started the first mission station in the region in around 1906. From its source the Zambezi flows south-west, being joined by its first significant tributary, the Kabompo River, and into Angola for about 240 km, where it is joined by a much larger tributary, the Lungue River, before turning south and back into Zambia. When it re-enters Zambia the Zambezi is approximately 400m wide in the rainy season with fast flowing white-water sections at the Cholwezi rapids. 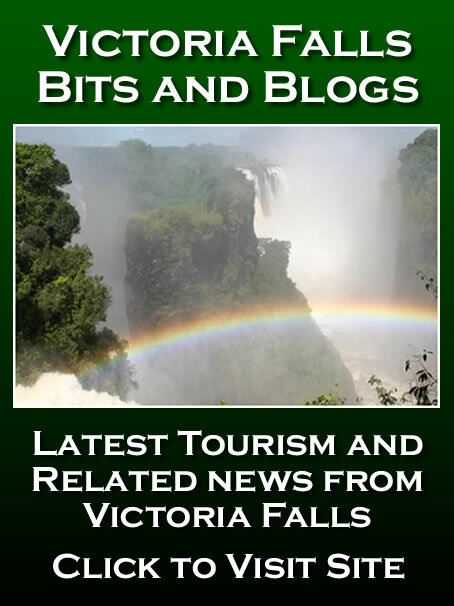 At Chavuma Falls, a few kilometres downstream from the border, the river is forced through a narrow gap in an outcrop of hard volcanic rock and tumbles over a three metre high waterfall. The water sounds like it is being blown through a hole, 'Chaa-VUM-aah', giving rise to the local name. The falls are drowned each year under the high seasonal water levels. The nearby town, of the same name, is situated on a hill overlooking the Zambezi and Kashyi plains, where another early mission station was established. From its source to Chavuma, about 350 km downstream, the river drops about 400 metres. From here to the Victoria Falls, 800 km distant, the level of the basin is very flat and uniform, dropping only by another 180 metres. The river is supplemented by another tributary, the Lungwebungu River, and another historical mission station was established at Chitokiloki. Further downstream near Kabompo are the Nyamboma rapids, marking the beginning of extensive floodplains. The river is wide and slow flowing through this section, travelling over a thick mantle of sand, evidence of the past northern extension of the Kalahari Desert, and forming the vast Barotse Floodplain which extended for some 200 km, being joined by the Luanginga River, which drains a large area to the west, and in flood by overflow of the Luampa/Luena River system from the east. In the rainy season the width of the flooded river can reach up to 25 km. 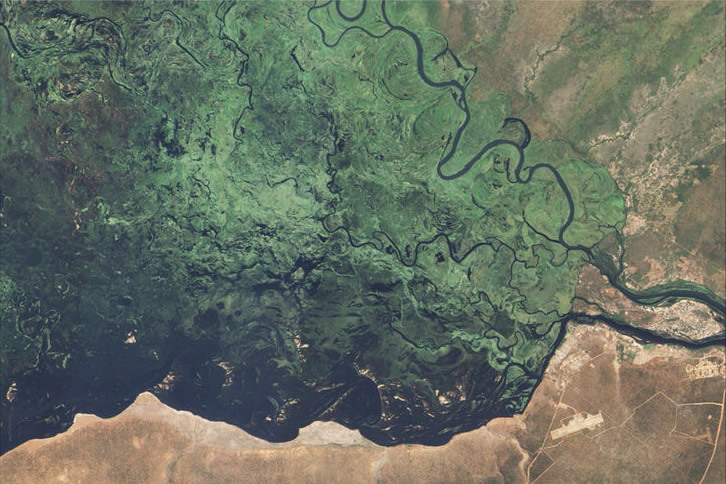 This section of the upper Zambezi River is known as Barotseland and is the domain of the Lozi people, who live, farm and fish on the floodplains during low water and whose lives are dominated by the seasonal flood cycle of the river. During the rainy season when the plains are in flood, they move to higher ground and forest fringes to escape the flood waters, led by their king, the Litunga, in an annual migration ceremony known as the Kubomboka. From the east it continues to receive numerous small streams, but on the west is without major tributaries for 240 km. South of settlement of Senanga the Ngonye Falls are worthy of note. 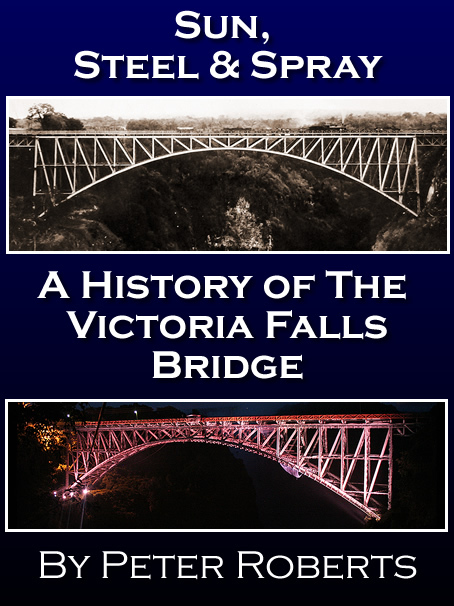 Situated a few hundred kilometres upstream of the Victoria Falls, near a small town called Sioma, they are formed by the same geological process as the Victoria Falls, with cracks in the basalt riverbed being eroded away to form the drop. Their height is only 10-25 meters, but the width of the falls forms a broad crescent, interrupted by rocky outcrops, creating an impressively picturesque scene. Upstream of these falls, the river is broad and shallow as it flows across Kalahari sands, but below the falls extensive white water rapids exist, as the river is hemmed in by gorges cut into basalt rock, much like the Victoria Falls but on a smaller scale. Further south, the Zambezi turns east and briefly forms the border between Zambia and Namibia's Caprivi Strip before emerging into the Caprivi Swamps at Katima Mulilo. At Katima Mulilo the variation in the height of the river from low water is up to 7 metres. The water flow at flood time varies between 2500–4500 cubic metres per second flowing at 7-8 km per hour. In 2004 the flow in full flood was recorded at 6000 cubic metre per second and approx 10km per hour. This extensive and complext wetland system lies on Namibia’s international border with Botswana, Zambia and Zimbabwe, and stretches from the Kwando River in the west to the Zimbabwean border-post at Kazungula in the east. The area is divided into five geographically distinct zones: the Upper Kwando (137 km2), Lower Kwando and Linyanti Swamps (3,830 km2), the emphemeral Lake Liambezi (406 km2), the Chobe River and marsh (311 km2) and the Zambezi flood-plains (1,800 km2). The swamplands are almost completely flat and topographically featureless, resulting in an unusual hydrology regieme. 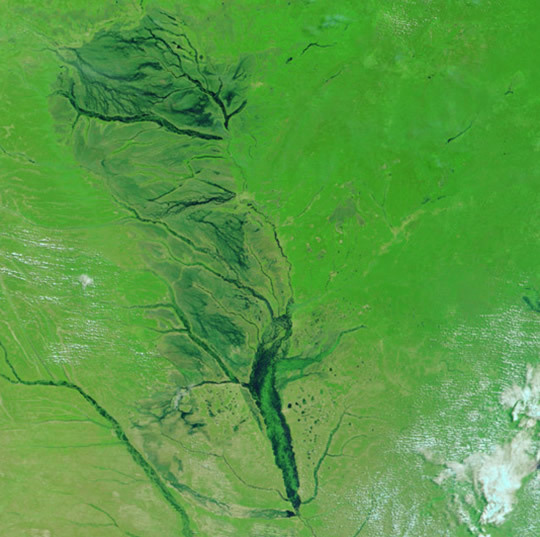 Under flood conditions, the Kwando is essentially linked to the Zambezi, with water flowing from the Kwando into the Linyanti Swamp, about 10% of which finally reaches Lake Liambezi. When full, Lake Liambezi has an outlet to the Chobe river, which subsequently joins the Zambezi at Kazungula. When the Zambezi is in flood, the flow is reversed and water is pushed up the Chobe to Lake Liambezi. It was in this region during the mid 1800s that the Makololo established dominance over the Lozi, eventually subjugating their whole kingdom. 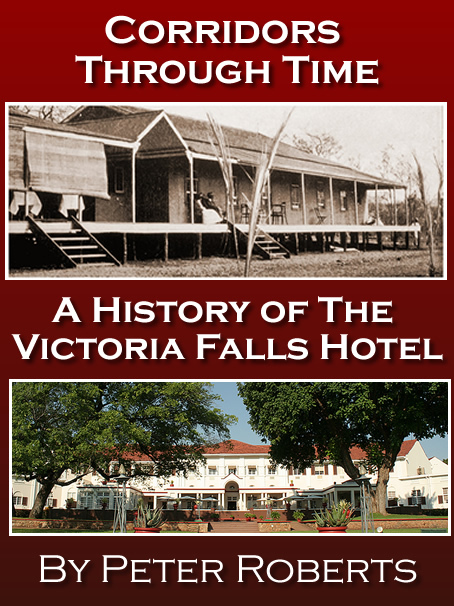 It was during this time that Dr David Livingstone first explored this region, discovering the river and being the first to link it with the known river mouth of the Zambezi on the east coast. The Makololo were later overthrown by the Lozi who regained their kingdom. The Caprivi Strip itself results from the colonial era, projecting east from the main part of Namibia (then German South-West Africa) expressly to give access to the Zambezi. Schuckmannsburg was the capital of the Caprivi until 1939 when it was moved to Katima Mulilo. The region itself consists of reed and papyrus beds interspersed with a myriad of channels and islands. One such channel, the Kasai, is 5 kilometres long and was opened up by the Germans to link the Zambezi and Chobe Rivers and avoid the Mombova rapids which were an obstacle to river navigation. An unintended consequence of this deal between these rival European colonial powers, which remains a peculiar feature of the region, is that where the Chobe and Zambezi Rivers meet, so apparently do four neighbouring countries - Zambia, Namibia, Botswana and Zimbabwe - a feature known as a 'quadripoint' - although there is some debate as to its existence. If so, it is the only place in the world where four countries meet like this. A large brown and white pole in the river marks the supposed spot (approximately 17°47′30″S 25°15′48″E). However there is debate as to if all four countries do indeed meet - modern sources and maps cite two separate trijunctions existing perhaps some 100 or 150 meters apart, where the countries of Botswana and Zambia meet and seperate Namibia from Zimbabwe. In 1970, South Africa, which at the time administered Namibia, informed Botswana that there was no common border between Botswana and Zambia, claiming that a quadripoint existed. As a result, South Africa claimed, the Kazungula Ferry, which links Botswana and Zambia at the quadripoint, was illegal. Botswana firmly rejected both claims. There was actually a confrontation and shots were fired at the ferry. some years later, the Rhodesian Army attacked and sank the ferry, maintaining that it was serving military purposes. Stories tell of a trader who established himself on an island near here called Konkumba in the early days, and who received demands to pay taxes by each of the different countries, who all claimed it as part of their own territory. His answer was always 'Prove the island is yours and I will pay'. The question of ownership is apparently still disputed to this day. Kazungula, a small border town in Botswana on the south bank of the Zambezi, marks the official border crossing point between Botswana and Zambia. About 20km downstream from Kazungula the swamplands end, and here the Zambezi traverses the Katambora rapids, with swirling white waters for several kilometres, before again entering calm waters. Flowing east from the Caprivi swamps the Zambezi River's valley and flood plain is wide and broad, ridged by sandstone hills, through which the river gently meanders. Here the river lies at an altitude just over 900 meters above sea-level, on the basalt sheet of the south-central African Plateau. 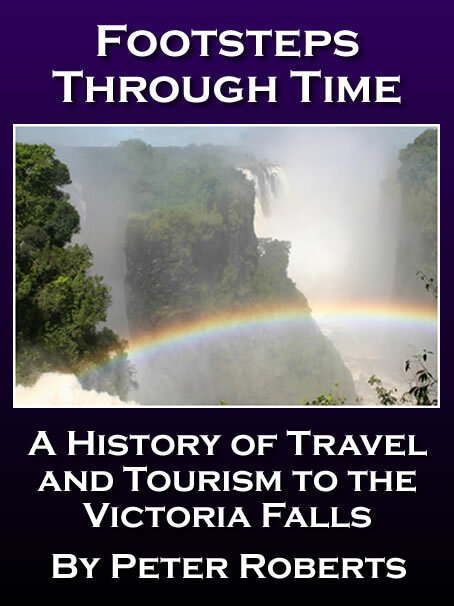 As it continues eastwards it suddenly reaches a chasm which cuts directly across the width of the river bed, and over which it flows creating the spectacular Victoria Falls - the boundary between the Upper and Middle Zambezi sections.